When it comes to smoothie bowls -- anything I have on hand is normally what goes into it. Frozen strawberries are one of those ingredients I always have on hand, and bananas are a pantry staple. These are two ingredients that I must always have in my smoothies/smoothie bowls. Matcha tea powder has become another pantry staple of mine and I have found that I love it most in smoothies. These smoothie bowls combine some of my favorite ingredients -- bananas, strawberries (because duh, they are in season), matcha tea powder, acai berry juice, and flaxseed meal. Can I get a 'yay' for a healthy, wholesome (and filling) breakfast option? The toppings though, are my favorite part of all. Granola, sunflower seeds, chia seeds and coconut flakes are always must-haves on my smoothie bowls. 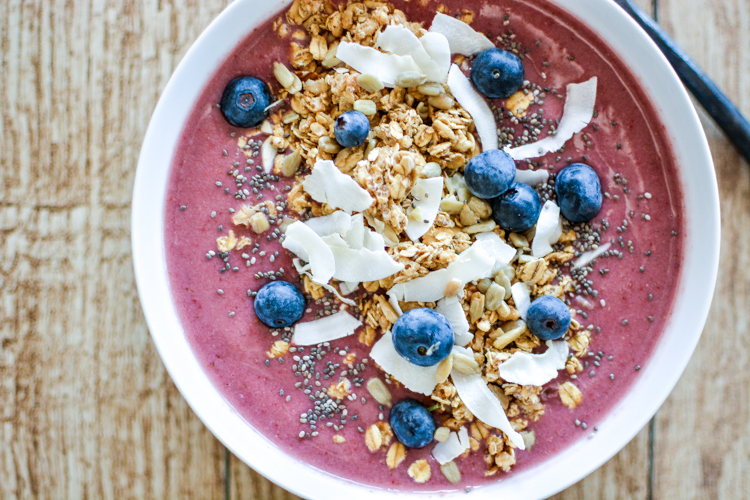 Throw some fresh fruit on top and it sends this smoothie bowl right over the top. Various Toppings: granola, unsweetened coconut flakes, chia seeds, sunflower seeds, blueberries. To a high-powered blender, add all of the ingredients as listed except for the "Various Toppings." Blend on high until completely smooth, about 1-2 minutes. Pour into a bowl and garnish with toppings of choice. I like a mixture of granola, unsweetened coconut flakes, chia seeds, sunflower seeds and blueberries. Oh, and one last thing -- ENJOY! A spoonful of matcha powder. Matcha powder mixed with water, for a thicker consistency. Matcha powder mixed with milk, to make a latte. Matcha powder in its original powder form.